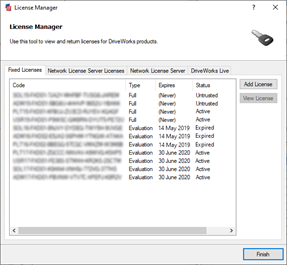 The Fixed License tab in the License Manager will show all Fixed Licenses that have been activated on the machine. The Product Code - The code used to activate the license will be listed here in full. Type - If the license is Full (permanent) or Temporary. Expires On - If temporary the date on which it expires. Days Remaining - If temporary the number of days remaining before expiration. Ensure the Fixed Licenses tab is selected and select the license from the list of available licenses. Click the View button to the right of the list of licenses. The machine a license is returned from must be connected to the internet to make use of this feature. From the License Details dialog click the Return license button. 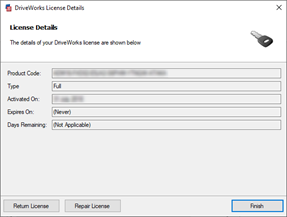 DriveWorks will attempt to return the license.